When you get to the Centre for Life you can choose to dump your buggy so it's a bit easier to get around, if like me you have more of your worldly goods scattered around the buggy than in your actual house, then it's worth it to keep the buggy on you. The Young Explorer's Zone is on the top floor. There is a lift, but you have to find a member of staff to access it (easy enough there has always been someone around whenever I've needed to use it.) The lift is a bit of a tight squeeze, but does fit my double buggy in it, as long as I can press myself into the wall when i'm in there with it. They've recently reopened the part of the museum where you can access the ramp to get to the top floor, which I always choose to do so I don't need to wait in a queue for the lift or go looking for staff if there isn't one around. In the middle of the Young Explorer's Zone is a large soft play. 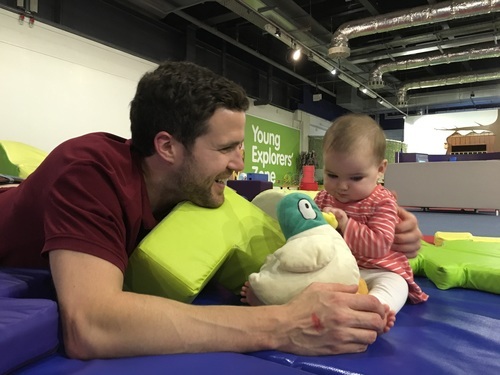 It's the type of soft play which is all on one level which is good so you can always see you child, and is more suitable for little babies to use than the multi level soft play areas. There are also seating areas around the soft play bit so that you can have a rest whilst supervising the kids. Beyond the soft play are play zones. 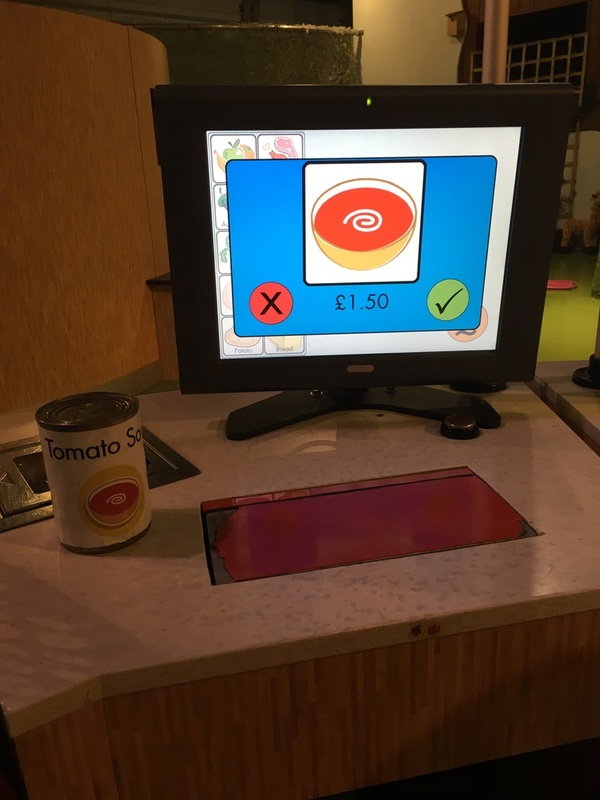 First is the shop, where the tills will actually scan the barcodes on the items and bring up the information on the little computer tills (I love this and every time we visit spend 10 minutes excitedly showing my non-plussed toddler, "Look Seb, it's soup, the till has brought up that it is soup. It's that amaz.... Seb....Seb wait for me.") Worth pointing out here that we visited at about 4pm on a Monday, it's probably the most untidy that I've seen the Young Explorer's Zone, and lots of the items from the shop were in the kitchen. Whenever I've been before towards late afternoon I've seen the staff tidying up and returning items to their correct areas, but that wasn't happening today. So even though its a right mess in some of these photos, it isn't this bad usually, and the shop is usually much better stocked than this, I saw loads of their barcoded boxes hidden in a drawer in the kitchen area so someone must have had fun moving everything around before we got there. It really didn't matter as my toddler couldn't care less, he loves creating his own mess, but thought I'd add the disclaimer as the shop photos are a bit underwhelming. Next is the kitchen where in addition to using the pots, pans, oven, fridge, taps and all of the play food in the drawers, there is also some aprons and chef's hats that kids can wear. The last play area is half recycle area, where kids can match items to the right recycling area, and half woodland area. 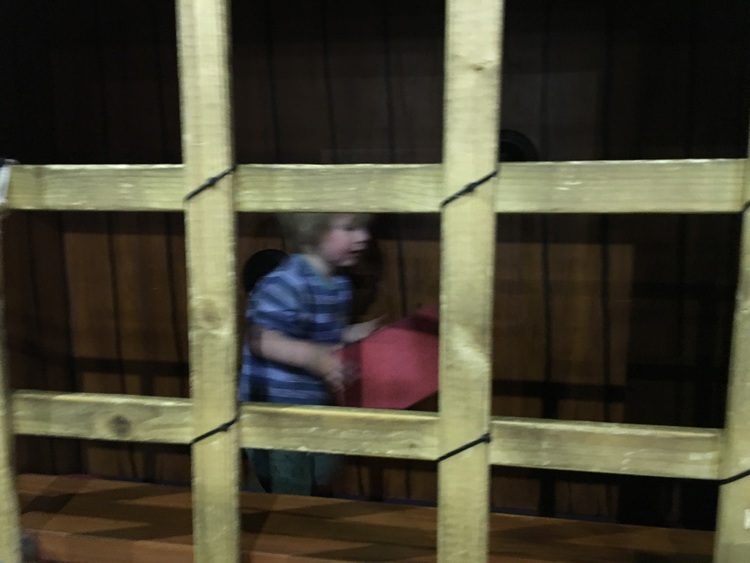 The woodland area has a tree house, tunnel with windows with animals meant to be living in the tunnel and holes where kids can put their hands in to feel and guess what is inside. There is also a raised tree house area, with a few stairs which spiral around a few times. I think every child who walks into the Young Explorer's Zone has fallen down these steps at least once, I think my toddler's total is about 5, but whilst it isn't ideal it hasn't caused him much damage as yet. But it is an area that they need close supervision. The rest of the Young Explorer's Zone is made up of activity stations and areas. 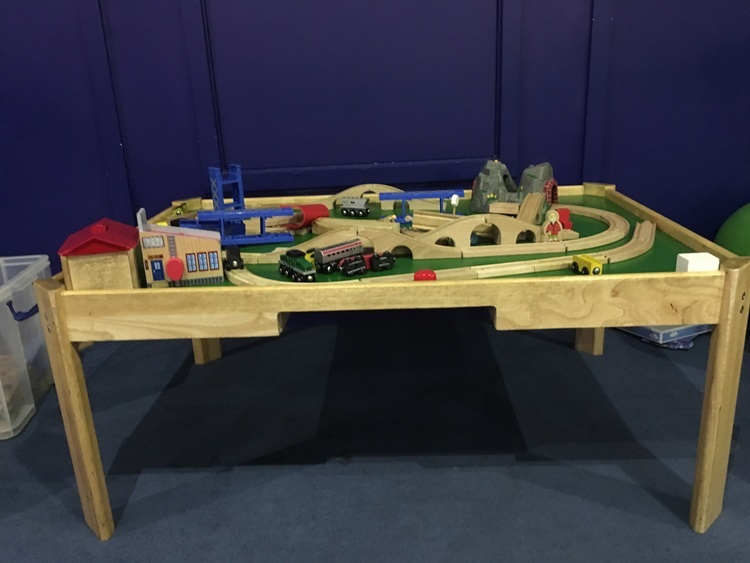 There are tables set up so that kids can play with a train track and lego pieces at waist height, as well as colouring in, craft and reading tables. There are some bigger pieces like a giant connect 4 board, some huge foam stacking sticks and counters, and a traffic based playmat. Before we left the kids area I remembered to take some photos of the toilet. They are right next to the Young Explorer's zone. It's easy enough to get a buggy into the toilet with you, and there was a changing table in there too. We didn't visit the cafe during this visit, but it has a good selection of hot and cold food, as well as a children's menu. You can also use the packed lunch area on the basement level if you bring your own food - perfect to make the day out less costly or if you have picky eaters. After we had spent about an hour and a half in the Young Explorer's Zone we decided to have a look at the Inside Out exhibition. This bit was for us as opposed to our toddler, but we thought he might be interested in the different animals, and is too young to understand that we're taking him to see his favourite animals when they are dead and skinned. It was only half an hour before the centre closed, so I thought we'd be okay to go in there with him, without risking him disrupting other people by making loads of noise. Thankfully it was pretty much empty, although we must have said "Don't touch the glass..." upwards of twenty times, leaving two-year old fingerprints on most of the exhibitions - sorry Centre for Life staff. The Inside Out exhibition was excellent, so interesting, he background images, video and sounds were all really dramatic too. I wish we'd been able to wander through at a slower pace, we only stayed a really short time. That was the end of our trip. We'll be back again soon no doubt. If you are thinking of visiting Life for the first time, I would really recommend the Pre-School days, you get reduced price entry (£7.50) and there are lots of extra things put on for little ones. Music classes by Piccolo, bubble discos, and guests such as animal handlers attend, so it's really good value. Frustratingly these aren't on over the summer holidays. The next one is planned for September 2016. A little tip, Piccolo sessions get filled up really quickly, so get there for opening time if it's something you really want to do. If you are visiting before the pre-school days, I think that if you pay for the day tickets, but decide that you want the annual pass then you can pay the extra to upgrade to the annual pass as long as you go back to the desk on the same day. Please note: children aged 12 and under must be accompanied by an adult. Please note: there is a maximum of three children per paying adult. Have you visited Centre for Life recently? What did you think? Leave me a comment below. or details of blog posts, things to do with kids in the North East, and random photos then follow me on Facebook, Instagram or Twitter by clicking the links at the bottom of this page.